AceList is the manufacturer of these knee pads. This company produces and distributes many different products starting with different home use devices to knee pads and other sporting goods meaning that although AceList is very versatile company that dabbles in many fields it still is able to deliver quality products that will last you a long time. Because these knee pads is a combination of knee pads and knee sleeves they have multiple usages. 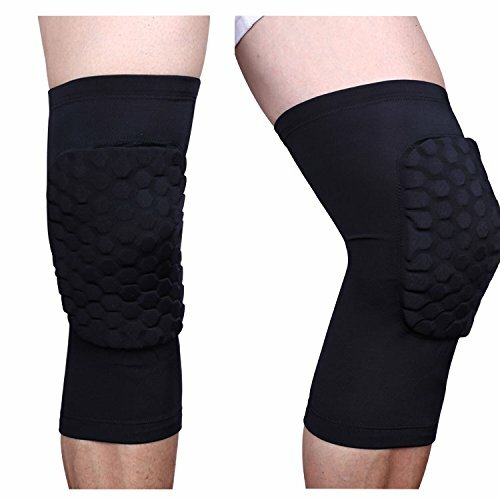 First and foremost you can use them as protective knee pads while doing different sports, because thanks to the design of these pads they are able to withstand anything from falls that occur while you dive for the ball during a volleyball game to blows to your knees that might happen during any contact sport like football. Secondly you can also use these pads simply as supportive pads for your muscles wile you are doing different everyday activities. But thanks to the longer sleeve portion of the knee pads you can also wear these pads during your recovery time after an injury or when you experience knee pain because the material and technology that is used to make these knees will promote healing as well as keep your knees intact. Among features of these knee pads there are things like two different types on the same knee pad, protective padding and compression technology. The two different types of these knee pads ensure that you can chose the kind of knee pad you specifically need – a shorter one that mainly covers the knee as well as a little above and below the knee or a longer pad that provides support not only to the knee but also for your thigh and shin. The padding is made from many honeycomb like hexagons that will provide a lot of support and shock absorption if you fall or receive a blow to your knee. And the fact that the cushioning isn’t one whole gel or foam pad but rather made from multiple small pads means that it won’t restrict the movement of your knees and you will be able to run, jump, squat and do all other activities the same as you would if you didn’t have knee pads on your knees. But the compression technology that is one of the characteristics of these particular knee pads that is provided by the fabric as well as style of the pad allows the pad to support your muscles during even the most vigorous of activities as well as keep your knees and the surrounding tissues warm so that it is easier to move around and your muscles are always ready for any activity. Like I mentioned before you could say that these knee pads is a combination of a knee pad and a knee sleeve because the design of these knee pads be it the longer or shorter version of them is a knee sleeve and knee pad combination with a padding in the kneecap area for shock absorption and injury prevention. This knee pad is available in black color so it will be discreet. And because the knee pad is very thin and the padding part in the knee area isn’t very bulky too it can easily be hidden under clothing. Because you are able to purchase two types of these AceList knee pads – long and short version there are 6 different sizes altogether for these knee pads ranging from medium to extra large size of both short and long knee pads. If you want knee pads that won’t restrict your movements but that still have the padding and the support you need to be more comfortable in performing different activities from running to playing sports then you should look into these knee pads by AceList. Their sleeve like design will keep your knee and surrounding muscles stable but the multiple hexagon padding on the knee cap area will prevent any injuries that might be caused by falls or blows. And the multiple available sizes enables you to fit the knee pads to your knees so they sit just right and are able to protect your knees in the most efficient way.